Fiji Airways Men’s 7s Coach, Gareth Baber has named a strong team to the 2018 Commonwealth Games at the Gold Coast in Australia. 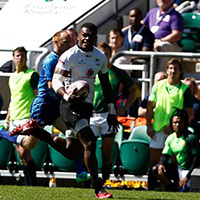 Only one overseas based player, Semi Kunatani who had indicated his availability has now been released by his Club and has been included in the Team, while the majority of the Team who have been taking part in the HSBC Series and recently won the Hamilton and Vancouver 7s Tournament have been retained by Coach. Baber has also named Samisoni Viriviri as the 13th player on standby to cover for the rover and wing position. Coach Baber has indicated that while he has named the Team, there are likely to be changes but only subject to any injuries sustained during the training preparations for the Commonwealth Games. 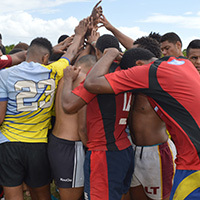 Fiji will be making a return to the Commonwealth Men’s rugby sevens tournament after a twelve year absence and Coach Baber highlighted that they will go into the tournament with only one aim and that is to win Fiji’s first Rugby 7s Gold Medal. He highlighted that everyone in the Team including the players understood the huge challenge that is before them and has asked all Fijians to continue to support the Team. “We thank you for your support and your prayers in the past which we greatly value and look forward to continued support and prayers as we venture for glory at the Commonwealth ”. FRU CEO Mr John O’Connor has challenged the team to mirror and repeat the feat of the 2016 Rio Olympics and be the first team to bring home the Commonwealth Games Men’s 7s Rugby Gold Medal and create history. The 2018 Commonwealth Games 7s will be held from the 13th to the 15th of April and the Fiji Airways Men’s 7s team will face off against Wales, Uganda and Sri Lanka. 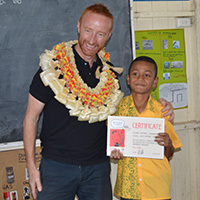 Semi Kunatani, Jasa Veremalua, Josua Vakurinabili, Paula Dranisinukula, Kalione Nasoko, Jerry Tuwai, Vatemo Ravouvou, Amenoni Nasilasila, Sevuloni Mocenacagi, Mesulame Kunavula, Eroni Sau, Alasio Naduva, Samisoni Viriviri. The Coach is expected to name his Team to Hong Kong by Thursday next week.